Altitude University I Drone Pilot Training I Start Flying Today! 50% Off Flash Sale Limited Time Only! Become a Certified Drone Pilot Today! 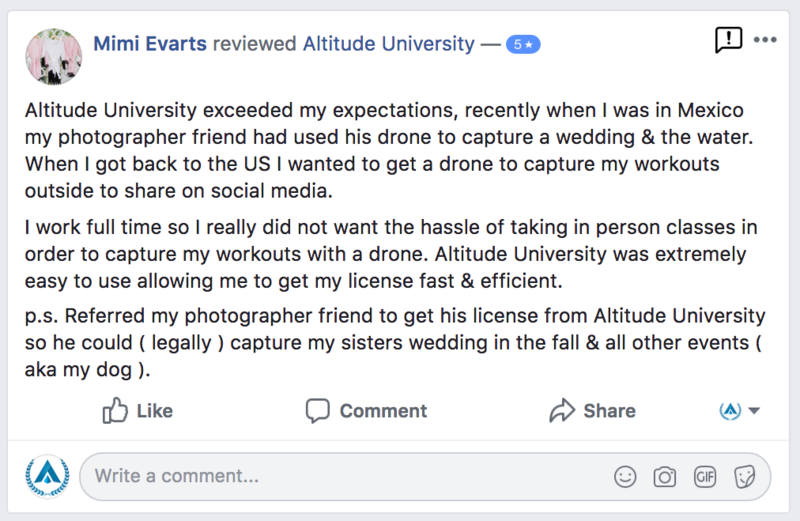 Altitude University is an online training platform that assists drone pilots in the process of acquiring their Remote Pilot Certificate. 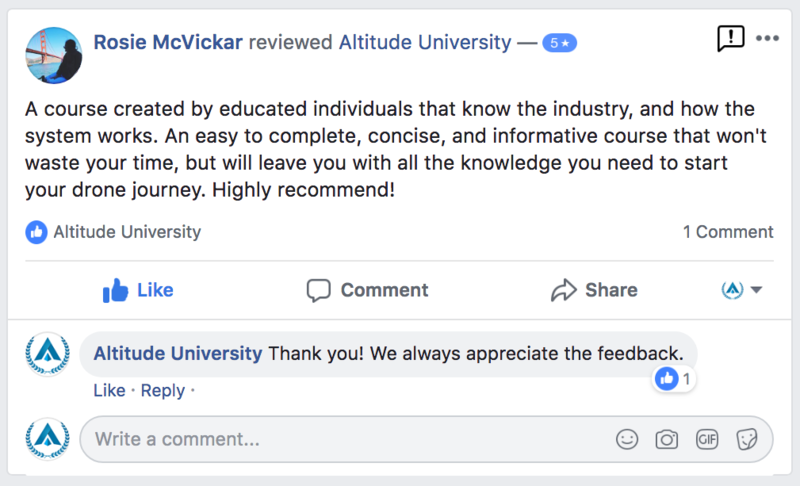 In our commitment to providing the right information to you, if you take the FAA Part 107 Test and do not pass, we will gladly return your enrollment fee back in full. Utilize over 200+ Real FAA Part 107 Practice Test Questions with instant grading and unlimited attempts. Never buy another Part 107 Test Prep Course again, with lifetime access and updates to new curriculum. Do I need a Part 107 License? Yes, if you are flying drones commercially, or want to receive compensation for your work, the FAA requires you to hold a Part 107 License. Extras: How To Schedule Your Exam, Register Your Drone, Tips & Tricks and more! 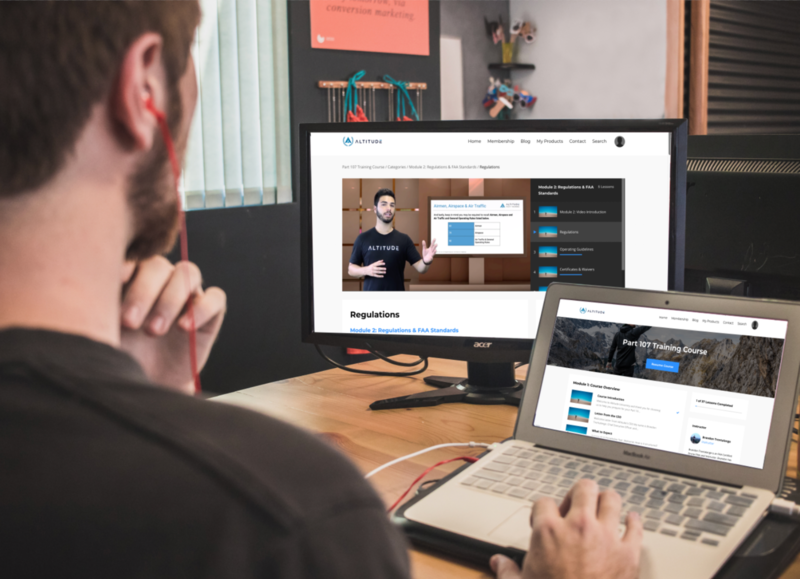 Our curriculum is developed by Drone Industry Professionals to help you pass the Part 107 Exam the first try! 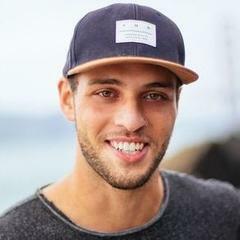 My name is Brandon Trentalange, CEO & Co-Founder of Altitude University and I will be guiding you through this course on Drone Laws and FAA Regulations. Alex Kavanagh is one of the most advanced drone pilots in the world. He utilizes the latest in high-end cinematic technology for his clients including Youtube, BMW, CNN, Lexus & more! 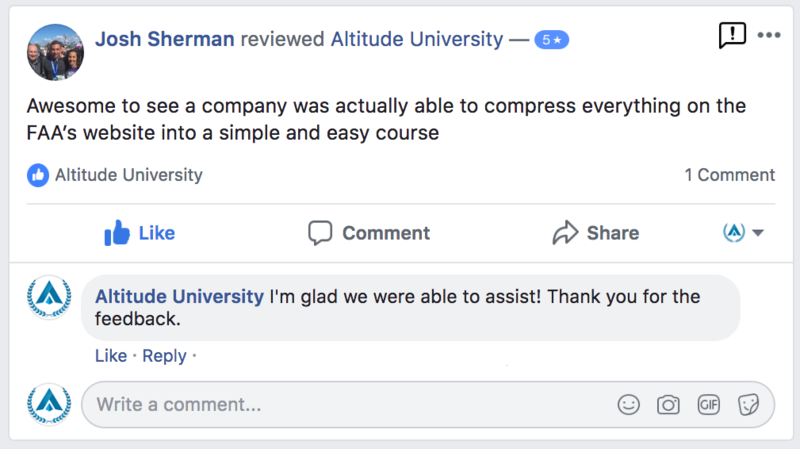 See how Altitude University helped Alex pass his recurrent Part 107 Exam studying with our premier Online Part 107 Test Prep Course. Join The Fastest Growing Online Drone Community! "This was an in depth review of the content that is necessary to understand when getting your license. This course took between 15-20 hours of studying. I was able to finish it in about 2 weeks. Passed the exam, now a Part 107 Licensed Pilot." AM I ELIGIBLE TO TAKE THE PART 107 EXAM? 3. Be in physical and mental condition to safely operate a small UAS. Lifetime! We aren't going to give something to you and then take it away. Use it for your Part 107 Renewal Test. This course is accessible 24/7 on a Desktop, Tablet or Mobile Device and includes all future content updates. The Curriculum is Self Paced. The information available in this course allows students to go back to previous chapters in order to review when necessary. Students are encouraged to go through the course at his/her own speed, however, the FAA estimates that average time it takes to study the material needed to pass the test is around 15- 20 hours of studying. We’re known for our 1:1 student support. Our team is available around the clock to ensure the best customer experience, understanding of the material provided and ultimately help you pass your exam the first try. You can always call us or send us an email at [email protected]. WHY DO I NEED A PART 107 LICENSE? The Federal Aviation Administration requires those interested in Flying Drones Commercially to pass the Part 107 Exam. You do not need a part 107 License to fly drones recreationally. However, those interested in acquiring a Part 107 Certification must demonstrate knowledge through a 60 question multiple choice test. Learn more in our free E-Book above. HOW MUCH DOES THE PART 107 EXAM COST? The Part 107 Exam costs $150 paid directly to your local testing center. 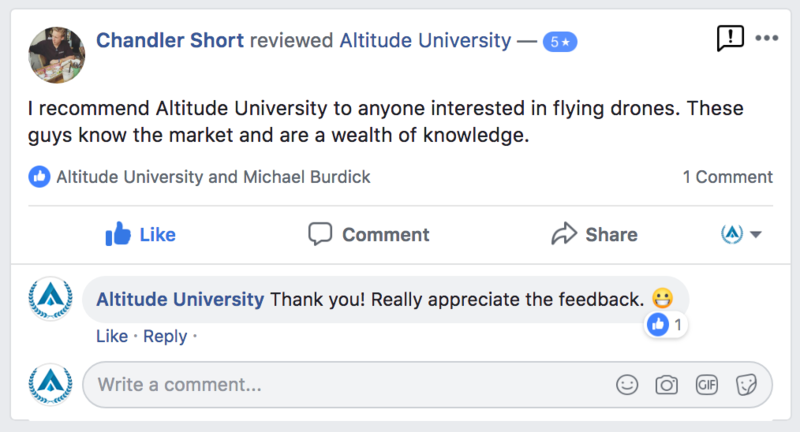 Join The Altitude Community Today! 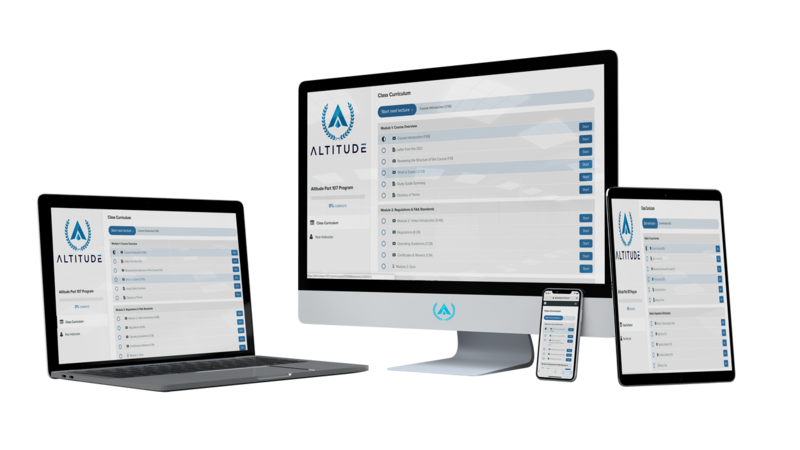 Be the first to know about Industry Insights, Innovations, Free Piloting Resources, and Discounts to Altitude Products!